Feminist connections can be found in the most unusual places. Frankenstein's monster has become one of our most enduring cultural icons -- from the old Boris Karloff movies (right,) to Phil Hartman on Saturday Night Live, to Peter Boyle in Mel Brooks' "Young Frankenstein." The monster -- or rather the Creature -- is often portrayed as a clumsy, inarticulate hulk. And yet, in the original Mary Woolstonecraft Shelley novel, he's not only articulate, but quite advanced in his thinking. In her book, "The Sexual Politics of Meat," Carol Adams calls attention to the creature's vegetarian nature -- a much overlooked, and yet deeply fascinating aspect of the story -- and to the novel's "feminist/gender issues." 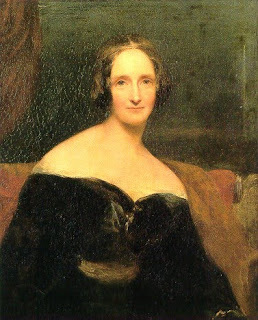 However, these themes are not so surprising once you know that "Frankenstein's" creator Mary Woolstonecraft Shelley (left) was the daughter of feminist philosopher Mary Woolstonecraft who wrote "A Vindication of the Rights of Women" in 1792. In the chapter titled "Frankenstein's Vegetarian Monster," Adams says the Creature's vegetarianism makes him "a more sympathetic being who considers how it exploits others." "My food is not that of man; I do not destroy the lamb and the kid, to glut my appetite; acorns and berries afford me sufficient nourishment. My companion will be of the same nature as myself, and will be content with the same fare. We shall make our bed of dried leaves; the sun will shine on us as on man, and will ripen our food. The picture I present to you is peaceful and human." Adams says, "the Creature's futile hopes for admittance into the human circle reflect the position of that time's vegetarians and feminists; they confront a world whose circles, so tightly drawn, refuse them admittance, dividing us from them." 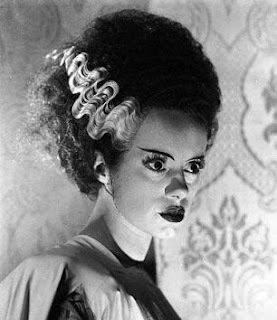 Actress Elsa Lanchester (right,) who played "The Bride of Frankenstein," was the daughter of feminist, suffragette, socialist and vegetarian Biddy Lanchester, who challenged the false naming of meat. Elsa sometimes referred to meat as "offal" and explained, "Biddy the vegetarian inspired the use of this word, that's what meat was to her." Merriam-Webster defines "offal" as the trimmings of a butchered animal, or rubbish. 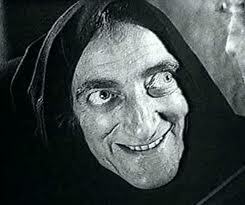 Actor Marty Feldman (below,) who played Igor in Mel Brooks' "Young Frankenstein," is quoted twice in the book. Of the meat-masculinity connection, Feldman said, "It has to do with the function of the male within our society Football players drink beer because it's a man's drink, and eat steak because it's a man's meal. The emphasis is on 'man-sized portions,' 'hero' sandwiches; the whole terminology of meat eating reflects masculine bias." Later, Feldman talks about his father who was in the army during World War II, "(he) could not eat meat because he was an Orthodox Jew. He practically starved to death and was treated with great contempt by the other soldiers because a soldier should eat steak." 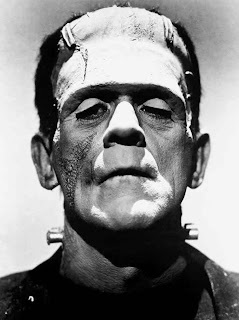 The Frankenstein-Feminist connection lie dormant for more than 100 years. But now that you can see it, ask yourself, "Who is the real monster?"